Micajah Clark Dyer Foundation, Inc.
Andrew gave an interesting summary of some unusual facts about Clark’s 1874 patent for his flying machine. 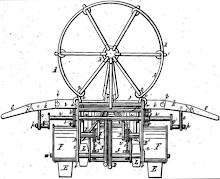 At the U.S. Patent Office, his patent is in Class 244, for “Aeronautics and Astronautics,” and Subclass 28, for “Airships with Beating Wings Sustained.” From 1790 to present, only fifty patents have been granted in Class 244/28, including one for a solar-powered hovering surveillance craft by security giant Rockwell in 2002. Clark’s Georgia patent is the second-oldest. 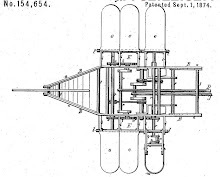 The most notable component of Clark’s patent is that it lays claim to controlling flight. Up to that point, mainstream flight was by steam balloons and fixed wing gliders. Balloons were at the mercy of the wind. Gliders flew only a few feet with the aid of ramps. Clark’s invention was transitional. It married the two concepts, balloon and wings, together decades before “zephyrs” appeared overseas. It also incorporated the means to control sustained flight. The reunion group was informed that work has begun on restoring Clark Dyer’s gravesite. The operations will include leveling the cemetery plots where Clark and his wife, Morena, are buried in the old Choestoe Church Cemetery; encasing the original, now deteriorated markers within a wall for future protection from the elements; and engraving a memorial on the wall to honor Clark as the inventor of Georgia’s first airplane. A search is underway to find the best place for a permanent museum or exhibition site for Clark’s patent and information. He also said that plans are being made to place exhibits in the local libraries and schools. An invitation was given for everyone interested in helping with the projects and getting information about future developments to let the Micajah Clark Dyer Foundation know of their interest.